Summer in Santa Fe is one of our favorite times of year. The city feels so alive, bustling with an extra special energy, and the people have an extra spring in their step. With June, comes the start of the Santa Fe Bandstand season. This community stage, set right in the heart of the Santa Fe Plaza, offers up a diverse musical lineup, free fun and dancing for all. Canyon Road, the Railyard District and the dozens of art galleries in Santa Fe are a must-see. During the summer months, the weather is perfect for wandering the streets, in and out of galleries, markets, cafés and local shops. Of course, the cuisine of our city is unparalleled, and come June and July, the experience only gets better. The many unique adobe restaurants and cafés of Santa Fe boast gorgeous outdoor seating, patios and decks lined with colorful flowerpots set against the crisp backdrop of the sunny blue skies. Hiking the surrounding, stunning landscape of Santa Fe is such a joy during this time of year, and the mountains are only a few minutes from the cultural downtown. The outdoor recreation goes beyond hiking. Try refreshing whitewater rafting, adventurous alpine horseback riding, fly-fishing or mountain biking. Santa Fe has it all! 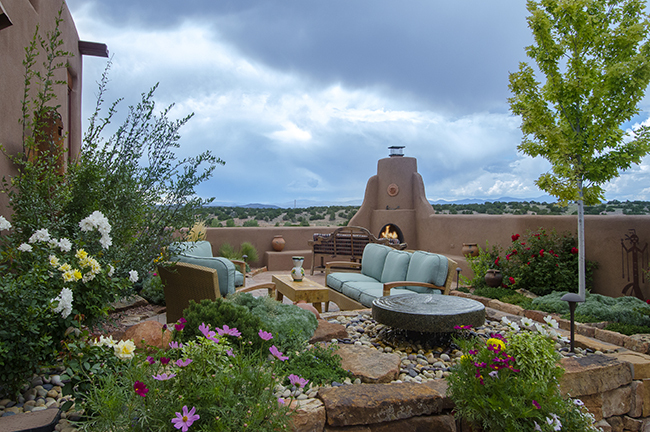 Although there are a million reasons to come visit Santa Fe this summer, there is only one place to stay. We invite you to book your memories with Adobe Destinations today! This entry was posted in Uncategorized and tagged Canyon Road Santa Fe, New Mexico, Santa Fe, Santa Fe Summer, Summer in Santa Fe, Summer Vacation, Summer Vacation in Santa Fe, Summer Vacation Rentals in Santa Fe, Vacation Rentals in Santa Fe. Bookmark the permalink.